In Ultimate Ghosts ‘n Goblins Arthur’s heroic battle with the underworld was finally over and the entrance to the realm was sealed. So he thought. Time passes and unknowing to mankind the dark lord has awaken from his slumber and kidnaps the princess in an effort to conquer the human world. Arthur must set off for the evil forest the gateway to the underworld to save the princess from imminent doom and keep the devil as well as his minions at bay. The excitement and intensity of the forerunner continues as our armored hero takes on this new challenge for the sake of humanity. 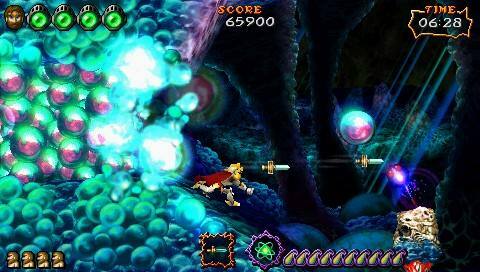 Even though that classic arcade game, Ghost 'n Goblins has been transformed into a 3D platformer, the original and the best makes a welcome addition to the archives on the PlayStation Portable which is classic arcade fun with a 21st century face lift that is a welcome addition to the world of gaming. Before this review continues, it must be mentioned that the original Ghosts 'n Goblins was an extremely difficult game and as on the PSP, the game is extremely difficult to master that is probably one of the most difficult games on the console. Just by completing the first two levels, you will probably have achieved what most mere mortals will never achieve, while Capcom sit in their ivory tower... smirking at those gamers who will try to beat this game. However, even though the game is difficult, it is extremely addictive and entertaining and even though you want to throw your PSP through the window, you'll be coming back for more punishment. New 3-D characters and environments enrich the side-scrolling adventure! The storyline of the current incarnation of Ghosts 'n Goblins once again has the gamer transforming into the legendary Arthur who must be stop a plethora of demons before they merge with the royal bloodline. Fortunately for the world of man, Arthur is up to the challenge has a plethora of new weapons and armour to assist in this unholy battle. Weapons such as the vine whip or the fire bottle will assist the gamer in their battles, however when it comes to the crunch, the classic daggers are the true winners. Although I must admit that the new crossbow is actually quite impressive and really lays waste to your foes. This subtle changes have truly transformed the original game into something that keeps its original spirit but has stepped up to the world of modern technology. 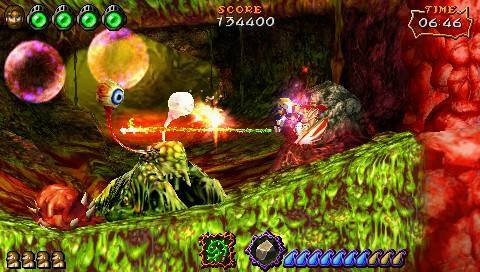 The gameplay of Ultimate Ghost 'n Goblins is virtually identical to the original game that in its essence is a side scrolling platform game that has the player fighting his way through almost every known demon in existence by using a variety of weapons, jumping, finding upgrades and of course challenging the bosses. The PSP was truly designed for this game as the controls are extremely responsive and actually feel perfect on the console. Whether you're double jumping, firing daggers or throwing magic bottles, no one will be complaining about this adept control system. Graphically and soundwise, the game is perfect and really brings back fond memories of the original game but with highly detailed 21st century graphics. The backgrounds are amazing and have great detail that truly immerses you into the gaming environment. The characters are fluid, the sounds are perfect and the original music has made a much needed return that will bring smiles to those old gamers and also those new at heart. Great stuff! In conclusion, Ultimate Ghost 'n Goblins is definitely one of the most hardest games that I have ever played (including the original) that is definitely a title that will have you coming back for more. Highly Recommended to those that love the classics or for those that want some addictive and frustrating arcade fun.